This background CG set is great. It gives off a very eerie, suspicious sort of feel and would fit well in a sci-fi mystery/thriller story of some kind. The images seem like the lab is underground somewhere, which is cool. I love the variations in light that you get between the images. Each one has at least 1 variation. It's a very unusual set that I really look forward to using. Professional quality and great value, I recommend it! If your game/visual novel needs a couple of backgrounds which depict darkish tech labs, offices, abandoned warehouses or surveillance room, you can call off the dogs for the hunt is over! This pack oh high resolution bitmaps offers an amazing array of top-notch quality cgs that will fit perfectly into your game. 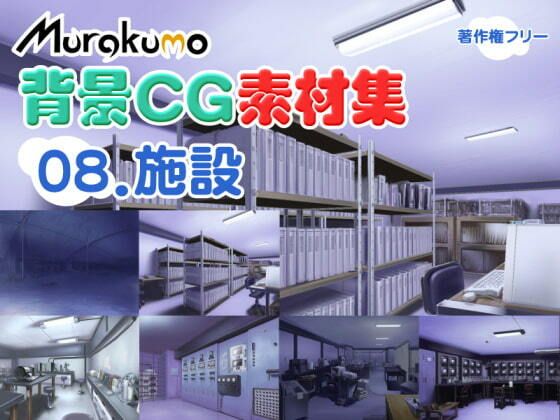 I cannot recommend Murakumo's work enough, buying this set of illustrations for your backgrounds will be the best investment you can make if you need an electrical room, a cctv room, experiments labs, office or storage scenery. It's a decent set if you need something for a science lab. It has a creepy underground feeling to it because it is all in unnatural light. The detail is actually pretty good. There's a ton of stuff in the scenes, and I don't really know what a lot of it is because I'm not that much of a science person. The style is consistent among Murakumo's other work. It's painterly, yet similar enough to other typical backgrounds that you could probably mix and match without people noticing.